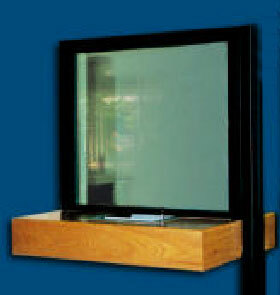 Bullet resistant pay windows are supplied with a natural anodized aluminium frame. Available with a "shallow" stainless steel pay tray or "deep" stainless steel pay drawer (lockable in three positions), built into post formed light oak counter top. G1: Handguns up to and including 9mm Parabellum. G2: Handguns up to and including .357 Magnum as well as 12 gauge shotgun firing buckshot. G3: AK47 assault rifle and 12 gauge shotgun firing Brenneke slugs.